Eli Lilly and Company engages in the discovery, development, manufacture, and sale of pharmaceutical products in the United States, Puerto Rico, and internationally. The company offers neuroscience products, endocrine products, oncology products, and cardiovascular agents for the treatment of various diseases. The company is member of the S&P Dividend Aristocrats index. Eli Lilly has paid uninterrupted dividends on its common stock since 1885 and increased payments to common shareholders every year for 42 years. From the end of 1998 up until December 2008 this dividend growth stock has delivered a negative annual average total return of 5.40% to its shareholders. The stock has lost over two thirds of its value from its peak in 2000. The stock performance resembles the continued slide in Pfizer (PFE) stock right before the dividend cut in January 2009. The company has managed to deliver an unimpressive 2.10% average annual increase in its EPS between 1999 and 2007. Earnings per share were a negative $1.89 due to several factors. One of the factors was a $4.46/share net impact associated with the acquisition of Imclone in 2008 for acquired IPR&D related to this acquisition. Another major item that affected earnings per share was a $1.20/share charge related to federal and state investigations regarding the drug Zyprexa. If it weren’t for these adjustments in earnings, adjusted EPS would have been $4.02, versus $3.54 in 2007. Analysts are expecting an increase in 2009 earnings per share to $4.20 and $4.50 by 2010. 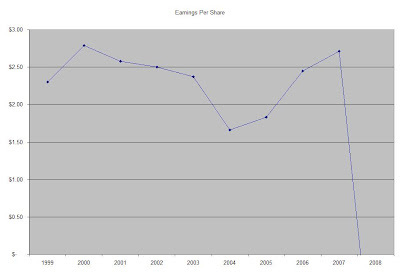 This is a rather steep increase from the range in which the stock’s earnings remained between 1999 and 2007. The most important factor for Elli Lilly and Co is their pipeline. The company’s future success depends upon its ability to discover and develop innovative new medicines that help people live longer, healthier, and more active lives. The Return on Equity has been in a steep decline, falling from 54% in 1999 to 24% in 2007. Rather than focus on absolute values for this indicator, I generally want to see at least a stable return on equity over time. Annual dividends have increased by an average of 8.20% annually since 1999, which is much higher than the growth in EPS. An 8 % growth in dividends translates into the dividend payment doubling every eight years. If we look at historical data, going as far back as 1974, Eli Lilly Company has actually managed to double its dividend payment every seven years on average. The dividend payout ratio remained above 50% since 2002. A lower payout is always a plus, since it leaves room for consistent dividend growth minimizing the impact of short-term fluctuations in earnings. Currently Eli Lilly and Co is trading at 8.20 times 2009 earnings and yields 5.70%. In comparison Pfizer (PFE) trades at a P/E multiple of 12.5 and yields 4.30%, Merck (MRK) trades at a P/E multiple of 10 and yields 5.50%, while Novartis (NVS) trades at a P/E multiple 11.60 while yielding 4.30%. I believe that the company will be attractively valued if it can cover its dividends at least two times by its earnings by the end of the year. While the high yield is tempting, I don’t like the declining returns on equity, high dividend payout ratio and the very slow growth in earnings over the past decade. I also don’t like the continued weakness in the stock over the past decade. It seems as if the market is pricing in something that few investors are considering. I would consider initiating a position at Eli Lilly & Co. when its 2009 earnings per share are posted and cover dividends at least by a factor of two.